The Namboothiri Trust is a charitable trust formed by a group of broad minded people who are believing IDHAN NA MAMA (means it is not for me. Yes; we believe, nothing is for us; but to the society as whole). Also all of our members are trying to practice the same principle in their daily life.All the members are Hi Tech and Fast enough to do things today what the world thinks of Tomorrow. We have a strong vision which is very simple but serious. . What little we do, we are resolved, must be perfect. You can find out the professionalism and simplicity in every step. We invite all sort of advises from all well wishers from all fields. Under the Chairmanship of N. Ajith. (CGM CMRL Aluva.Kochi. ), our General Secretary N.Sivadas,(Deputy Supdt of Police. Rtd.) 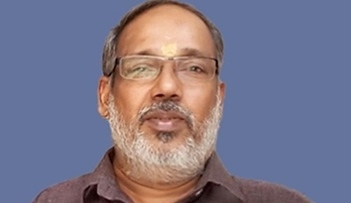 is guiding the college with the help of Treasurer M P. Jayanthan Namboothiri. (Chartered accountant. North Paravoor. ) and Principal Dr. M.C SABU, Ph.D. The Fee structure is fixed such a way that every common public can afford the same even though the Govt. is allowing us to charge much more than what we have fixed. Unless other trusts, we never interfere in day to day college academic matters. For that we have an efficient principal. To assist him we have an Academic Committee. We have a governing council also for the smooth functioning of the College. But we do assemble the director board once in every month for discussing and approving the proposals of Academic Committee, Finance Committee and Planning Committee. The success of the team is by the real support of our Members, the real back bone. Deputy Supdt of Police. Rtd.